Beautiful peace globe! Yay, peace! Sorry, the last one was me! A truly international globe… from Finland to Morocco! 🙂 international and one. Peace! Of course I want peace, but there is no one who could grant it. It must be demanded. The powers that rule, profit too much from the war industry. Those in power will relinquish nothing without insistent demands! As long as our political and economical situation is as it is today no one can grant peace, you’re right. World is one big complicated business case – me and my benefits. That’s why we need strong NGOs and social media to spread the word – we want to live in peace. It also means new way of thinking. If oil is not forever then we need to do changes. War is no answer to get what we want. It’s always ordinary and poor people who suffer most. For example, if infrastructure is built mainly for private cars it has to be changed. All politicians should work together, not against each others and behave like adults and stop denigration. You are the first peace blogger to fly a peace globe from Morocco. You represent country #51 in the peace globe movement. I am so excited. Thank you for participating!! Lovely peace globe and post. I am happy to report there are many out there like it. Peace from the United States. Wow, and I’m not even Moroccan! but it’s good if a Finn in Morocco spreads this peace message! Thanks for your visit! Peace! Peace! Have a great day! 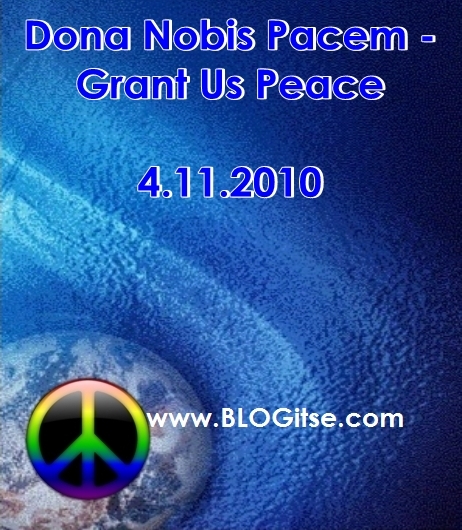 Grant us peace! And may we value it as a priceless treasure!